Peter E. Bauer, Rev. Peter E. Bauer is a United Church Of Christ Minister. There is something sublime, if not mystical, regarding hearing a good symphony orchestra. A listener can be impressed by the assemblage of the musicians on stage, the positioning of the concertmaster and the work of the conductor. On October 28, 2018, I got to witness all of these dynamics at play with the Princeton Symphony Orchestra. Concerto No. 5 in E-Flat Major, “ Emperor “. Watching the orchestra along with the interplay of Lehninger, Barnatan and Concertmaster Dora Dmitrova was an absolute joy. These musicians obviously loved this romantic period music and performed with great passion, vigor and at times subtlety. The Piano Concerto No. 3 in C minor, Op. 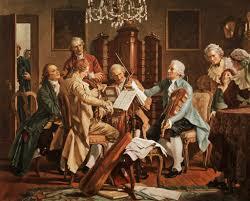 37, was composed by Ludwig van Beethoven in 1800 and was first performed on 5 April 1803, with the composer as soloist. The Sunday afternoon concert displayed a rich contrast between sections that burst with rippling sound and then interplay with the piano that echoed a lullaby quality. There was effective use of oboe and horns. Currently, with all of the conflict and division occurring in our world and in our society, it is a gift to hear timeless music that helps not only to restore one’s soul, but also to gain perspective regarding time. Yes, the Beatles once said “ Roll Over Beethoven “ and Paul McCartney once said “ Let Me Roll It “. Maybe, it’s time for Beethoven to roll over us and penetrate our mind, our heart and our limbic system with his beauty and hope and optimism. Our world needs that and so do we.